A language service that makes it painless to handle all types of .ignore files such as .gitignore, .tfignore, etc. Syntax highlighting for all types of .ignore file. Correct file icons will be shown for all the .ignore files. Hovering over any path entry will give details about what files the path points to. To filter the results directly in the tooltip, simply place the cursor in the bottom search field and start typing. 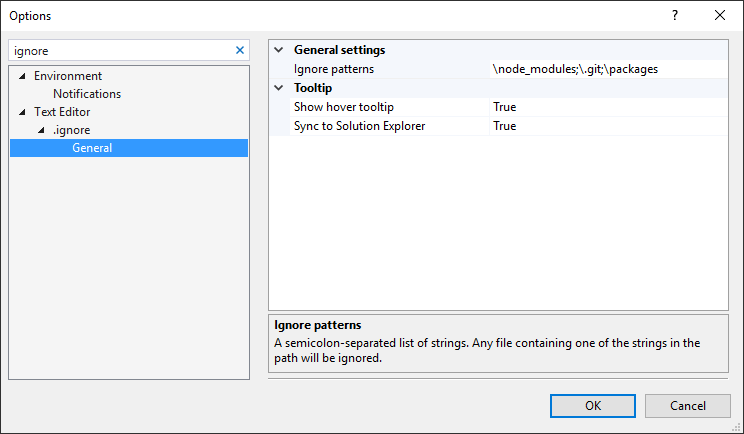 Double-clicking any file in the tooltip will open it up in Visual Studio. If a file path doesn't point to a file or folder, then it is being grayed out. Right-click in any .ignore file and select Remove non-matching entries. This action can be undone by invoking the Undo command (ctrl-z). You can drag any file or folder from Solution Explorer or from the file system using Windows Explorer. 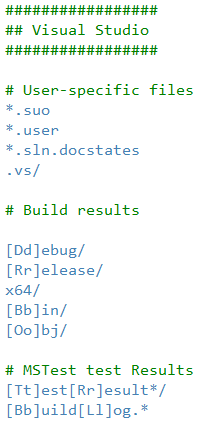 This will add the correct relative path to the .ignore file. Validation helps you avoid typos and other mistakes. For instance, it will catch the user of../ which is not allowed in .ignore files. Light bulbs appear in the margin to give you quick access to perform helpful actions. 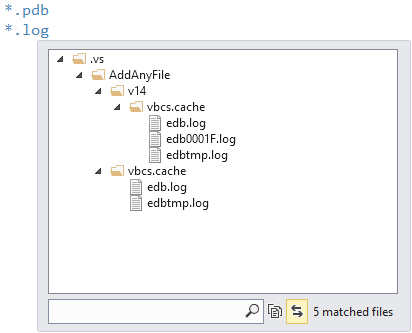 Delete matching file entries... will delete the matching files and folders from disk. If any of the files are part of a project in the solution, the project will be updated to reflect the deletion of the files. 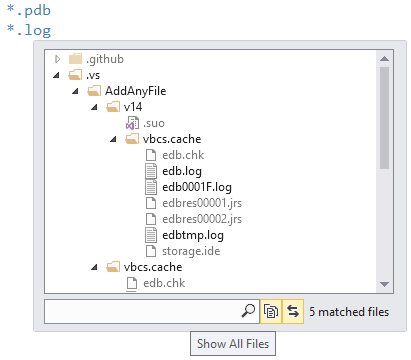 Exclude matching entries from project... will not delete the files and folder from disk, it will only remove any reference to them from the project. 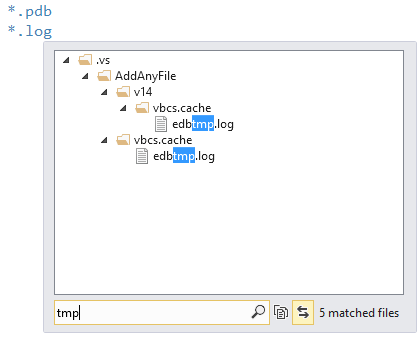 Remove non-matching entry will delete the current line from the .ignore file. This action can be undone by invoking theUndo command (ctrl-z). 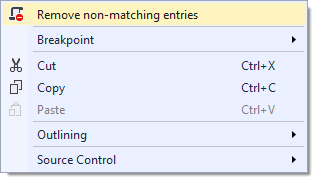 Remove all non-matching entry will delete all non-matching entries in the .ignore file. It does the same as the right-click command does. This action can be undone by invoking theUndo command (ctrl-z). Various settings are available in the Tools -> Options dialog. You can find them underText Editor/.ignore in the list.